Are electric cars really the future of motoring? Where next for electric cars? For well over 100 years the internal combustion engine has ruled the roads. But Alastair Darling's budget promise of a low-carbon future and a £750m investment fund for emerging technologies could see us swapping conventional cars for electric ones. While there was no reference in Darling's speech to earlier reports of a £5,000 grant towards the purchase of a new electric car, the government has given the strongest signal yet that it is committed to reducing the environmental impact made to the planet by the UK. So are electric cars ready for the mainstream? At the moment there are only a handful of truly green electric cars on sale, ranging from the absurd G Wiz and Mega e-City, to the Lotus Elise-inspired Tesla Roadster. Things are picking up, however. The Mitsubishi i-MIEV supermini, MINI E and Smart ED will go on sale soon, followed by a range of mainstream hybrids that have engines and plug-in batteries, such as the Vauxhall Ampera, VW Golf and Ford Focus. However, the one factor that unites all these cars is cost. A Tesla Roadster, for instance, will set you back £92,000, three-times the price of a Lotus Elise. And the teeny new Mitsubishi i-MIEV is expected to cost at least £20,000 in 2010. Mile-per-mile it will take a lot of driving before you'll recoup the costs, £5k grant or not. Peter Spinney from the Association of British Drivers agrees that cost is a drawback: "I actually have a Honda Hybrid and consider it an excellent car with surprisingly good performance. But they are all quite expensive, and you face a new battery after just five years costing about £5,000." And what about the resale values of electric cars? Will people actually want them second-hand? Daniel Harrison, Managing Editor of Parkers, the used car price guide, says: "Residual values of electric cars will remain firm as long as they are in relatively low numbers. "The problem will come when they go mainstream. There isn't the demand outside London - buyers just don't want them. Why buy a small electric car for £15,000 that needs charging every 80 miles, when you can get a Citroen C1 that does 62mpg and has 109g/km for only £8k? "Then there are the batteries. At the moment car manufacturers effectively underwrite them so owners don't need to worry about replacements. This is obviously unsustainable and puts a further question mark into the heads of potential buyers." Range, too, is a further drawback. Even the best electric car batteries will struggle to travel more than 200 miles before requiring a lengthy top-up. Car makers are getting around this with a new range of hybrids which you will be able to plug-in, with an engine as a back-up. Take the Vauxhall Ampera. It will allow you to drive 40 miles on electric before the back-up motor needs to be used, unlike a Toyota Prius which can only manage a handful of miles on its batteries. Where to charge electric cars? Then there's the problem of filling them. Have you ever come across an electric charging bay? Unlike a petrol or diesel car where you can pop into the nearest filling station, electric cars require a long period of charging, so you will require an overnight stay on longish journeys. So a relatively poor infrastructure of charging points in the UK has been largely responsible for hindering the progress of the electric car. But this is changing fast. Calvey Taylor-Haw, Managing Director of Elektromotive, the company which designs and builds charging points for electric cars, says that in six weeks the 100th parking bay in London will be fitted with an electric meter, a number set to double by the end of 2009. Outside the UK there are 160 similar bays. 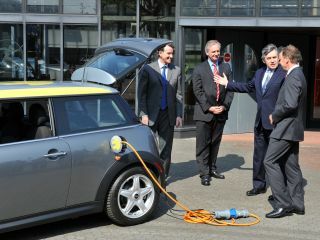 He says: "Our aim is to have Elektrobays on every street and in all car parks around the UK." Ambitious, but he predicts that it will be 2015 before the electric car is truly viable on UK roads. Next Page Where next for electric cars?